Architectural rendering of the new Roaring Brook Umbrella Bar. Image Courtesy of Killington Resort. 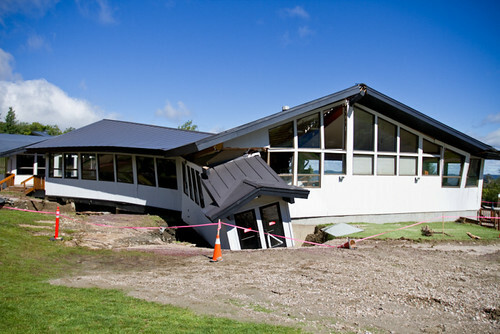 After the heavy flooding caused by Tropical Storm Irene knocked [R198R, Killington Resort]'s Superstar Pub from its foundation in late August, the resort was faced with a major quandry—where would guests go for slopeside beers, music and great views of the mountain? 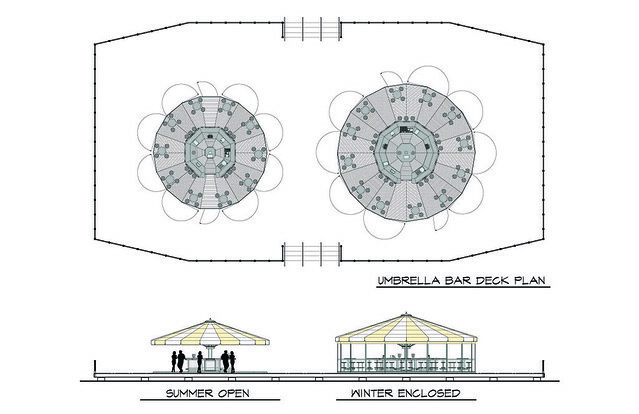 Named for the stream that rose to dislodge the Superstar Pub duing Irene, the Roaring Brook Umbrella Bar will include two heated Umbrella Bars with seating for 100 people plus 200 additional seats on the deck. It will serve up beverages, light fare and some music. In addition, this fully equipped bar area and deck is designed to withstand all weather conditions and will be open year-round providing guests with optimal views of Killington Peak, Skye Peak and the Superstar Trail. The partially collapsed Superstar Pub, prior to dismantling. Photo Courtesy of Killington Resort. The Umbrella Bar is one of many new improvements guests can look forward to at Killington this season. Plans are in place to cover and heat the maze area at the base of the K-1 Express Gondola, and a new tubing park will debut across from the Killington Grand Hotel. More information about improvements at "The Beast" can be found here.